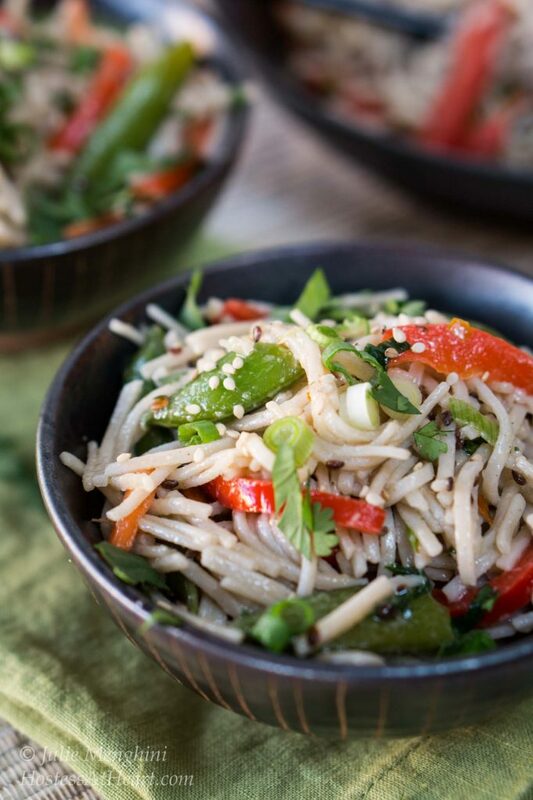 This Asian Inspired Soba Noodle Salad recipe is a great recipe to take to a potluck or for lunch at work. Add chicken or shrimp and you have a quick and delicious dinner. After months of cloudy days, we’re finally seeing a hint of spring. For John and I, that means bike rides, hiking, and eating a little different. By eating differently I mean replacing the heavier comfort food that kept us hibernating and in a warm fuzzy fog, to a lighter, I’m waking up, kind of food. 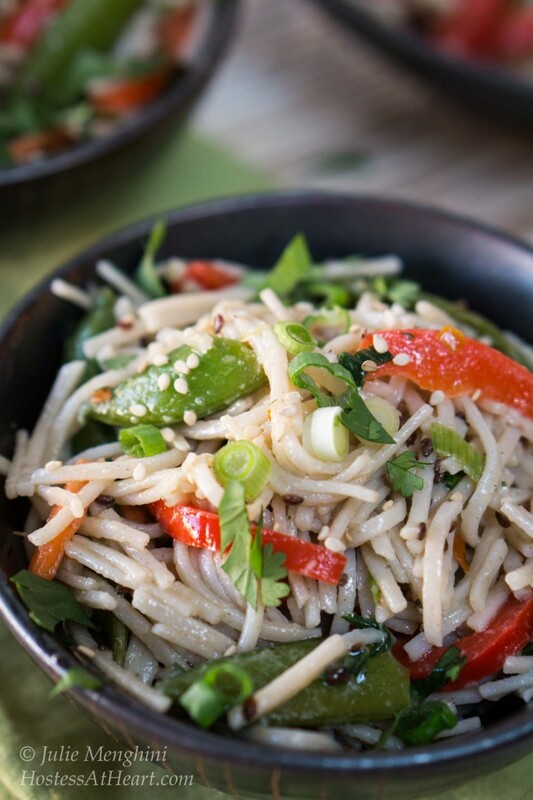 This Asian Inspired Soba Noodle Salad recipe fits right into that category. What is a Soba noodle? Soba noodles are a thin Japanese noodle made from buckwheat flour. 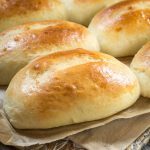 They are yummy and cook in only 4 minutes! They’re delicious cold and just beg you to add a bunch of veggies and a nice vinaigrette or sauce. You can make them organic and are gluten free as well. I served this salad as a side dish. You could easily eat it as a main meal and add chicken or shrimp as other options. 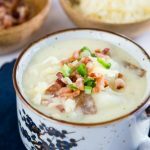 It would be a great dish to take to a potluck or to work for lunch because you can make it ahead of time and it stays for days in the refrigerator. Like any pasta don’t overcook it and it will not get soggy. I used a pasta cooker to cook noodles. After removing the noodles, I used the basket to steam my veggies. with the same hot water. It made this salad really quick to put together and clean up a breeze. 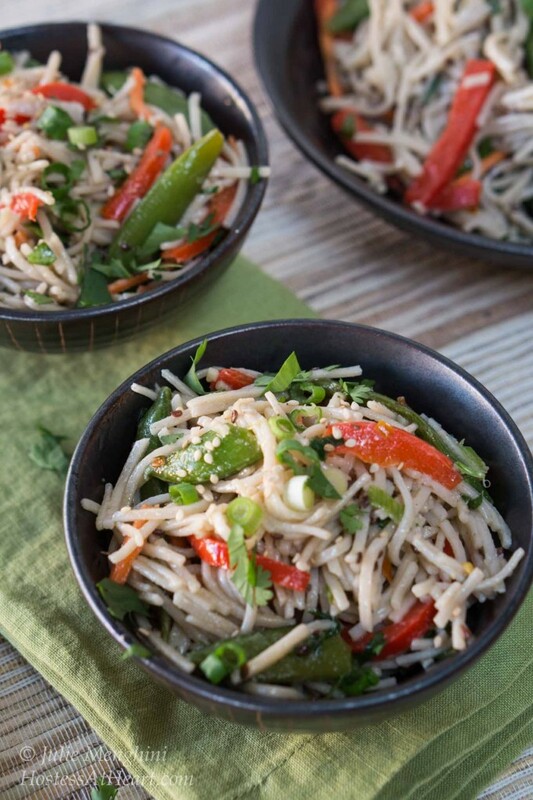 Store this Soba Noodle Salad in the refrigerator and it makes delicious leftovers for a couple of days. I just love dishes that I can put with other meals don’t you? It sure cuts down on the meal prep time. 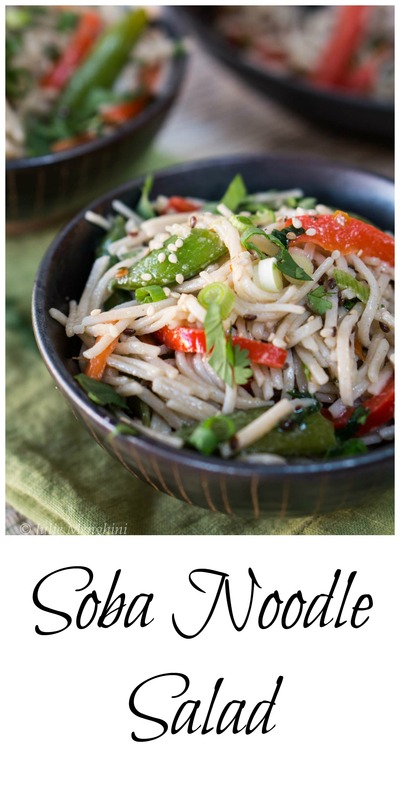 This Soba Noodle Salad is a great recipe to take to a potluck or for lunch at work. Add chicken or shrimp and you have a quick and delicious dinner. Add soba noodles to rapidly boiling water. Cook for 4 minutes. Drain and remove to a bowl. Refrigerate and allow to chill. Add sesame seeds to a skillet and heat over medium heat, stirring frequently, until browned and aromatic. Remove seeds from skillet or seeds will continue to cook. Steam red pepper and snow peas for 3 to 4 minutes. While steaming, prepare a cold-water bath by adding cold water and ice to a bowl. Add steamed vegetables to cold water. Drain when cooled. Prepare vinaigrette by adding all ingredients to a jar or bowl. Shake or whisk to combine. 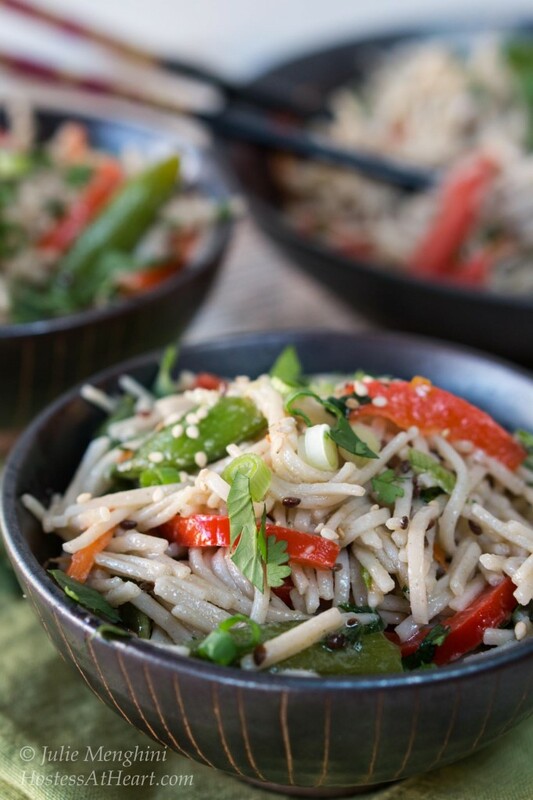 In a large bowl, combine noodles, steamed vegetables, matchstick carrots, green onion and sesame seeds. Pour vinaigrette over salad until thoroughly coated. Refrigerate any leftover vinaigrette or salad in a covered container. This salad may be made a day in advance. 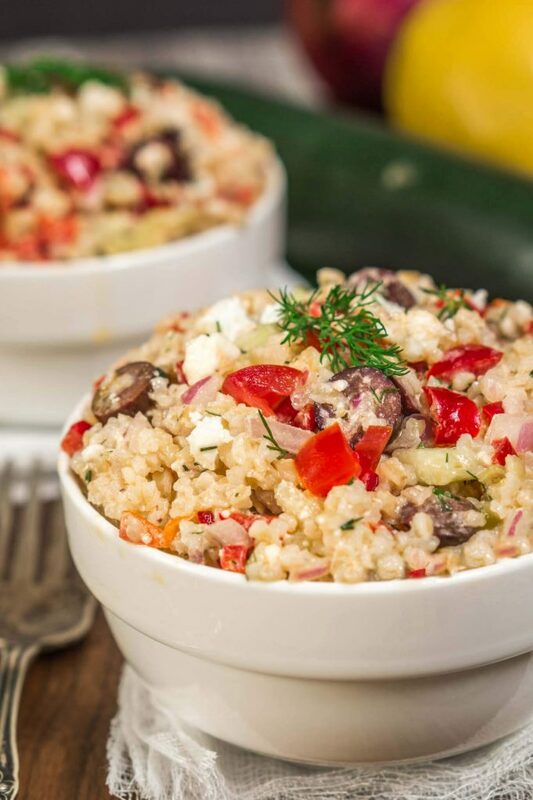 If you are still looking for some great salad ideas, here are a couple of my favorite ones! Julie this is a lovely salad. Sorry for the very late comment but I just found this in my junk folder along with many many other emails that I never saw. To say the least I am horrified and I apologize. I don’t know what is going on with my computer but I don’t like it and have to figure out what to do. My sister said my stuff was going into her junk folder too. I don’t know the answer to some of this. It seems like there is more and more junk, but you have to go through it so you don’t miss one of your friends posts. Too bad that such a thing even exists. I don’t understand doing something to just make peoples lives difficult. I am 360 degrees opposite. 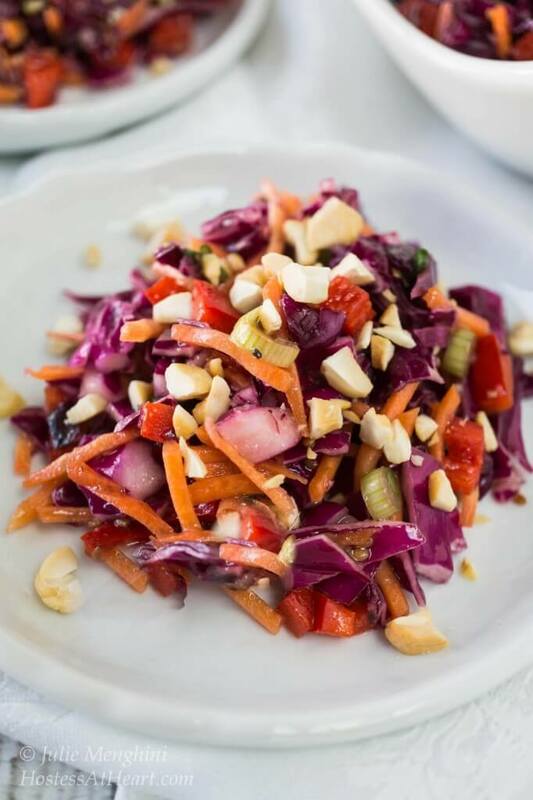 This salad looks perfect to help usher in spring. Delicious, Julie! It appears to be the perfect lunch! Thank you Nancy! I ate it for lunch and loved it. I enjoy making soba noodle salad. It is easy to make and I can always mix it with veggies. Thanks for sharing. Have a wonderful week. Thank you so much for stopping by! You are right that these salads are so versatile! Thank you so much Mila! They are just perfect for so many things. The presentation is so good! Made me hungry! Thank you Nivedita! Enjoy your day! I eat a lot of salads, but I don’t have one like this in my usual rotation. 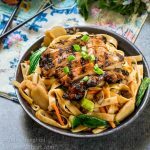 It has, for the most parts, ingredients that I commonly have around – except for the noodles … but I’m eager to buy some and try this. Thank you Jeff! It took me a while to try them because I wasn’t sure John would like them (he’s Italian and has pasta opinions). 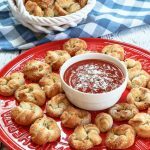 We loved them because they are really light and don’t get sticky in this recipe. I appreciate you stopping by! Thank you Judi! It really is lite and delicious. Thank you Chitra! Enjoy your day! I have been planning to make soba noodles for so long. Thanks for sharing this recipe. I have learnt a lot from you! Thank you so much Liz! I hope you’ll give them a try. I love the photos! Looks amazing. And this would be perfect for dinner for the state I’m in. I’ve never tried the soba noodle Julie, but my word this dish does look good. You’ve been quite busy in the kitchen haven’t you? Great job! I’ll bet the sesame vinaigrette really worked wonders, loved all the ingredients. Roll on spring eh? From temps in the 80’s last week, we’re back to 50’s and 60’s. Thank you Loretta! I think you would love these noodles. In the 80’s? I think that’s just a bit warm for coming out of winter. I hope you’ve been having a great time in the gardens. This dish looks very light and refreshing while still filling Julie; I love it! Thank you Jess! Thanks for stopping by! I’m getting confident that spring is on it’s way so here comes the salads.